If you are a beginner in the medical field, having a list of the easiest healthcare jobs to get into that also pay well is a great convenience for you. First, we need to congratulate you on the choice you have made. Healthcare industry is among the biggest industries in the US and it offers numerous opportunities for a career for both beginners and professionals. In the US, there are currently more than 5,000 hospitals with 18 million workers who are mostly women, which is not so common in the medical field. Women are simply traditionally believed to be prone to do these types of jobs since they are helpful, they like taking care of people and helping them when they are in need and they show a great interest in the human body and health problems. However, men are also good at this job and they can do various jobs within this field very successfully. These jobs go from simply giving treatment to performing serious surgeries. With the predicted growth of 19% by 2024, healthcare jobs offer many opportunities for starting a career even if you do not have a bachelor or master degree or you decide to attend college and work at the same time. Good salaries in this field make the employed relaxed, and those who work and study gain a lot of practice at the hospital during this period. So, it is not surprising that a great majority of the employed in this field got their degrees while doing a well-paid job. However, many people who have started their careers by doing well- paid healthcare jobs without having high education have also used the experience gained in this way as a starting point for doing this job in any other type of offices in the future. Medical secretaries can learn a lot about software, computer program,s and programming while doing this job. On the other hand, some of these people make amazing careers by doing top paid jobs in this field. Whatever reason you might have to choose a job in healthcare, you must know that these jobs require standing for many hours, talking to other people calmly, a lot of patience and a constant smile and politeness. If you are willing to change the city or the country of your employment often, check our list of the 7 Best Paying Healthcare Jobs that Allow You to Travel. If, however, this is not tempting for you, our list of 12 easiest healthcare jobs to get into that also pay well is enough. 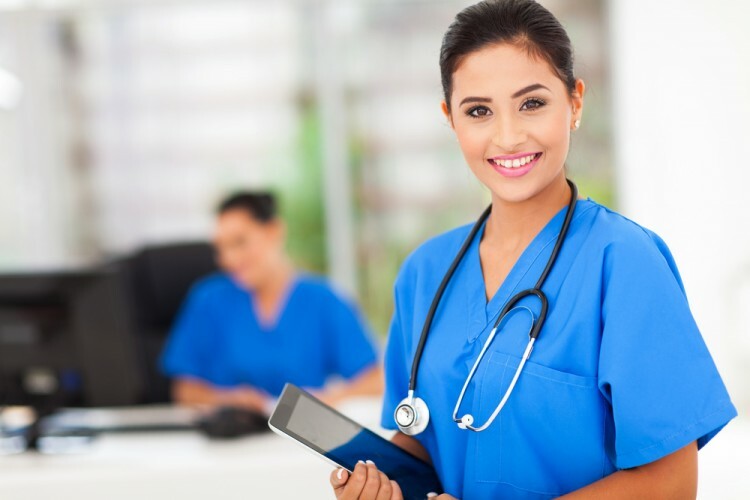 To list the easiest healthcare jobs to get into that also pay well, we started from those jobs which are perfect for beginners, taking suggestions from Rammusen Colege, and those that don’t require experience (listed on Monster), and we used more recommendations we found on related blogs and sites. Then, we listed the annual salaries for these jobs using Bureau of Labor Statistics and ranked the jobs according to these sums. It was easy to list the first 12 of them once we had found the information about salaries. The list is here, so choose the job which is perfect for you and then you might also consider calling your potential employer.